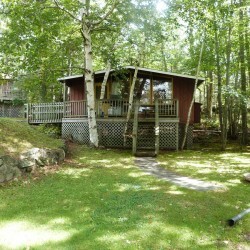 Our modern chalet style cottages are all newly renovated, bright & spacious. All cottages are excellently appointed & fully equipped for housekeeping. Kitchens have a refrigerator, stove, toaster, drip coffee maker, microwave & electric heat. 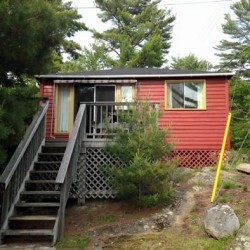 Each cottage has a three piece washroom with shower, flat screen satellite tv, propane BBQ, picnic table & deck. All bedding is supplied. Please bring your own towels and dish towels. For the comfort of all guests, our cottages are all SMOKE FREE and PET FREE. Please make your own pet care arrangements. 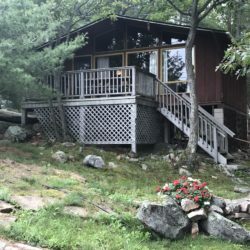 Scroll down for a list of our clean and cozy cottages! 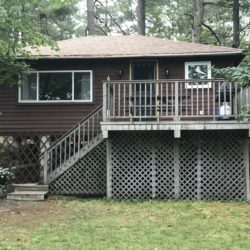 Spacious 2 bedroom cottage with a bigger bathroom and living room area. 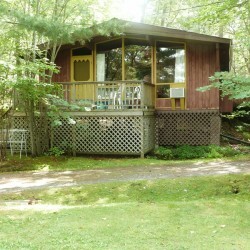 A queen bed and 2 single beds sleep up to 4 people, with a fabulous view of bay sunsets right from the deck. Max. occupancy 5 adults or 2 adults and 4 children under 13. 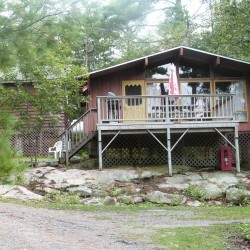 Hilltop 2 bedroom cottage with a queen sized bed and 2 singles, fireplace and air conditioning. Also, a spectacular view of the bay right from your deck. Max. occupancy 5 adults or 2 adults and 4 children under 13. 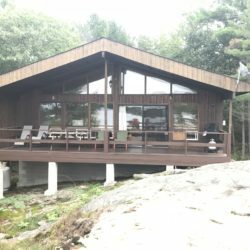 A traditional 2 bedroom cottage with a queen bed and 2 single beds, and a fireplace. Great bay view from the front deck. Max. occupancy 5 adults or 2 adults and 4 children under 13. 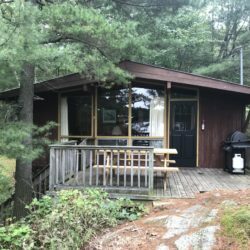 Comfortable 2 bedroom cottage nestled among the pines with a queen sized bed and 2 single beds, with a fireplace. Gorgeous bay view from your deck. Max. occupancy 5 adults or 2 adults and 4 children under 13.